“The dosage could easily be underestimated by the users because it doesn’t give you that immediate hit,” said Dr. Robert Stevenson, who saw the patient shortly after he showed up in the emergency room of the Saint John Regional Hospital just over a year ago. Stevenson, a cardiologist, recognized the man as his patient. He was already being treated for coronary artery disease. He said the man was not a pot smoker and hadn’t smoked pot since his youth. However, the patient did quickly disclose that he’d taken the lollipop from a friend, hoping to get some relief for his arthritis pain and a little help to sleep. Stevenson called on Dr. Alexandra Saunders to try to figure out how much drug the man had consumed. She asked the patient where he had gotten it from and after conducting an internet search of the dispensary in the area, she called to ask what was in the candy. Saunders explained that she was inquiring on behalf of a patient but because she wasn’t a member of the dispensary, says the person on the phone would not give her the dosing information. Saunders said the lollipop contained about 90 mg of THC, whereas a single joint contains about seven mg of THC. She said the patient didn’t realized what he’d done until he started hallucinating, and she thinks the psychological stress may have triggered the cardiac event. She said THC also has an inflammatory impact on the lining of the blood vessels, which also have been a factor. When asked what dispensary she contacted, Saunders could not recall the name of the shop but thinks it may have been in uptown Saint John. She couldn’t remember the name brand of the lollipop, and the patient never did provide a wrapper. Stevenson said the man did recover from his anxiety and was discharged from the hospital within 24 hours. Still, the doctors view this case as an early warning of problems to come. They’ve written an article titled “Marijuana Lollipop-Induced Myocardial Infarction,” which has been published in the Canadian Journal of Cardiology. “It heightens our awareness of how these marijuana-naive patients, particularly elderly patients, could easily stumble onto this, looking for some form of relief,” Stevenson said of the case. As chief internal medicine resident, Saunders said she just came off a rotation where she saw a large population of elderly patients with different types of arthritis. She was surprised, she said, by how many of them expressed an interest in using recreational marijuana for pain treatment. “And these are smaller, older ladies that I never would have thought of, before,” said Saunders. Both physicians think there is a widespread misunderstanding that marijuana is a kind of cure-all. In reality, they said, it’s only medically indicated for just a few problems, including nausea related to cancer treatments and certain seizure conditions. 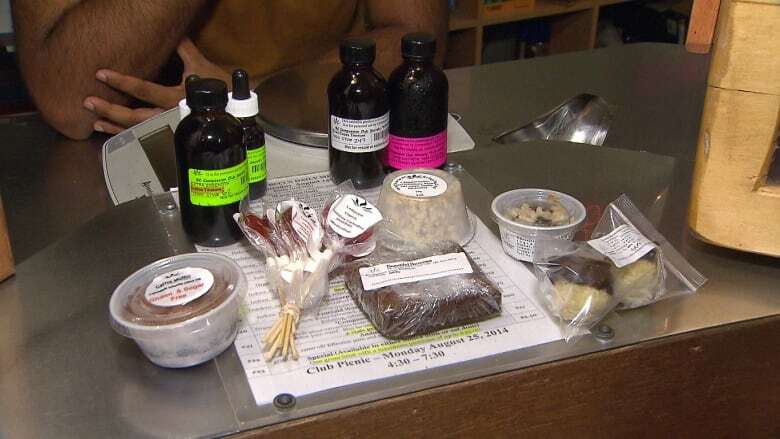 The federal government has pledged to legalize cannabis edibles no later than Oct. 17, 2019.